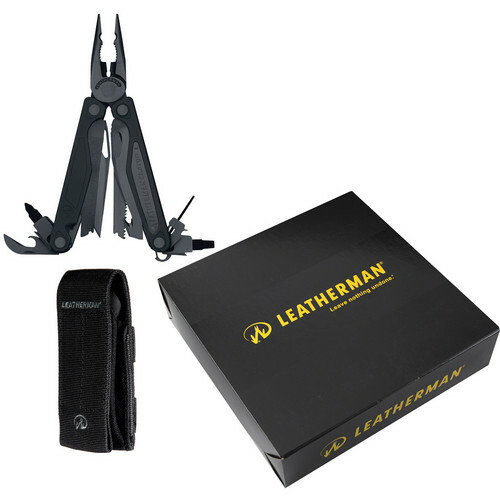 The Leatherman Charge ALX Multi-Tool features stainless steel construction with a stainless finish and a set of 18 locking tools that include: a one-handed accessible 2.9" 420HC serrated blade and a 154CM straight blade, cutting hook, two set of pliers, two wire cutters, wire stripper, crimper, four screwdrivers, push/pull saw, three files-one diamond coated, and 8 bits. The eyeglass screwdriver and combination Phillips #1 & 2 bit are removable. The six additional double-ended bits come in a separately packaged plastic strip. Additionally, there's a bottle/can opener, and an 8" ruler. The blades, files and saw are outside accessible. For convenience, the Charge ALX features a replaceable pocket clip plus a lanyard ring at the open end. The black nylon MOLLE (Modular Lightweight Load-carrying Equipment) sheath features a webbing loop with a snap closure on the rear, and a touch fastened front closure. The Charge ALX Multi-Tool is assembled in the USA. Hex bits: 5/32, 9/64, 1/8, 7/64, 3/32, 5/64, 1/16, 0.5"
Box Dimensions (LxWxH) 5.5 x 3.7 x 1.7"